Welcome to Hawkins, Indiana. The official behind-the-scenes companion guide to the first two seasons of Stranger Things and beyond, brought to life with exclusive photos and stunning concept art. Stranger things have happened. . . . When the first season of Stranger Things debuted on Netflix in the summer of 2016, the show struck a nerve with millions of viewers worldwide and received broad critical acclaim. The series has gone on to win six Emmy Awards, but its success was driven more than anything by word of mouth, resonating across generations. Viewers feel personal connections to the characters. Now fans can immerse themselves in the world―or worlds―of Hawkins, Indiana, like never before. 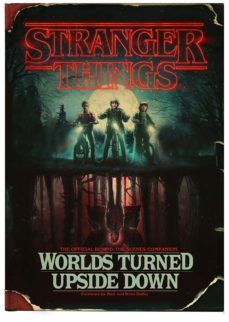 Inside you’ll find · original commentary and a foreword from creators Matt and Ross Duffer · exclusive interviews with the stars of the show, including Millie Bobby Brown, Finn Wolfhard, and David Harbour · the show’s earliest drafts, pitches to Netflix, and casting calls · insights into the Duffers’ creative process from the entire crew―from costume and set designers to composers and visual-effects specialists · deep dives into the cultural artifacts and references that inspired the look and feel of the show · a map of everyday Hawkins―with clues charting the network of the Upside Down · a digital copy of the Morse code disk Eleven uses, so you can decipher secret messages embedded throughout the text · a look into the future of the series―including a sneak preview of season three! Adding whole new layers to enrich the viewing experience, this keepsake is essential reading for anyone and everyone who loves Stranger Things. sn apisui si umop apisdn Note: The ebook is best viewed on a colour device with a larger screen.